A night of broken and almost non-existent sleep was more than made up for by a freezing cold shower- nothing like it to make you feel more human in the unbelievable heat of Athens! For our first full day in Athens, we thought that there was no better way to spend it than to visit the Acropolis in all its glory. We head out feeling relatively cool and optimistic, though about half an hour later when we reached our destination, we were already looking spectacularly hot and dishevelled! At the height of the Acropolis, the temperature was over 42 degrees, with little shade. The impressive view and astounding composition of the towering structure of the monuments were, however, enough to allow us to briefly cast our minds away from the intensity of the heat. 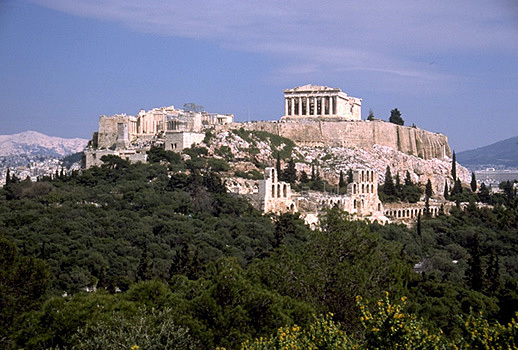 Having been constructed in the mid-sixth century BC, the mysticism of the Acropolis was heightened by the fact that it had only been reconstructed and renovated twice since its final known occupation. Interestingly, more artefacts from the Acropolis are in fact situated in British museums, rather than the Acropolis Museum which accompanies the main site. After surviving the blistering inferno, we ventured down the million and one steps from the Acropolis and sought refuge in a small cafe, where the greeting of our friend the air conditioning awaited us! Having refuelled with gallons of fluid at lunch, we sought out ‘Bits and Bytes’ internet cafe in order to research and plan the remainder of our trip. This experience was soon accompanied by our first taste of foreign ice cream- if you go to Athens, seek out one of the fruit sorbets- the best cure for sunburn and overheating! That night back at our hostel, we were joined by two Dutch girls, who had been on their travels for a couple of weeks or so. After several attempts at some Dutch lingo, we were joined by a new American roommate Trevor, who sat playing the guitar on the balcony for a while. We were then re-joined by our friend Max from the night before who started playing the guitar and singing and, needless to say, he had our little travelling group completely hooked on him! Athens seems to come alive at about 2am just as you want to sleep, so we were serenaded by a mixture of Katy Perry, Black Eyed Peas and Pixie Lott, blasting across from the opposite balcony!